An annual event held in conjunction with the Gettysburg Address anniversary. A parade of Civil War living history groups begins at 1:00pm. 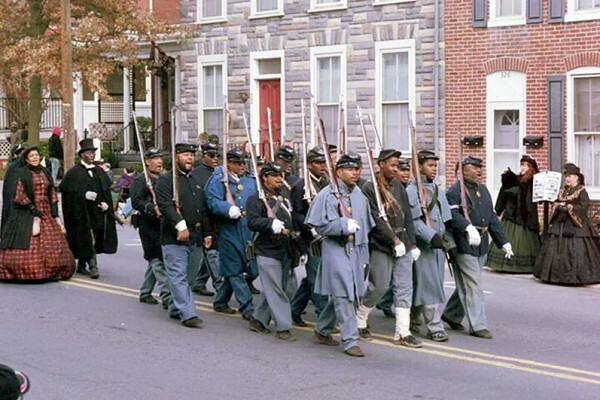 Join us in honoring the soldiers and civilians of the American Civil War in this special annual parade held in conjunction with the Gettysburg Address anniversary. The parade will line up on Lefever Street, will make a left onto Baltimore Street, right onto Steinwehr Avenue and will proceed up Steinwher Avenue and will make a left onto Taneytown Road, up Taneytown Road and then a left onto Cyclorama Drive where the parade will disperse. The annual event is sponsored by the Sons of Veterans Reserve, the Military Department of the Sons of the Union Veterans of the Civil War. An annual event held in conjunction with the Gettysburg Address anniversary. A parade of Civil War living history groups begins at 1:00pm. The parade will line up on Lefever Street, will make a left onto Baltimore Street, right onto Steinwehr Avenue and will proceed up Steinwher Avenue and will make a left onto Taneytown Road, up Taneytown Road and then a left onto Cyclorama Drive where the parade will disperse.